Top: CAPTURE OF FORT MACON—COMPANIES A AND B OF THE 5TH RHODE ISLAND REGIMENT COVERING THE WORKING PARTIES WHILE CONSTRUCTING CAPT. MORRIS’S THREE PARROTT GUN SIEGE BATTERIES. FROM A SKETCH BY OUR SPECIAL ARTIST, J. H. SCHELL. 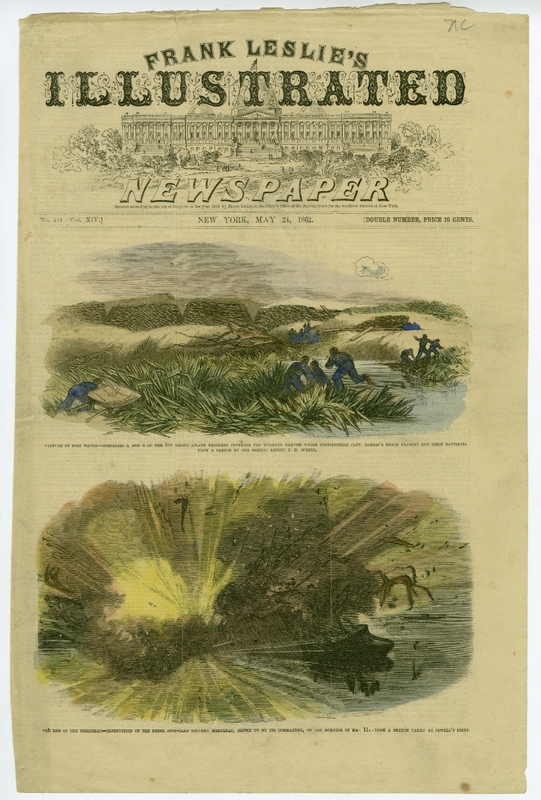 Bottom: THE END OF THE MERRIMAC—DESTRUCTION OF THE REBEL IRON-CLAD STEAMER MERRIMAC, BLOWN UP BY ITS COMMANDER, ON THE MORNING OF MAY 11.—FROM A SKETCH TAKEN AT SEWELL’S POINT. Citation: North Carolina County Photographic Collection (P0001), Flat Box 1, folder P0001/0188. North Carolina Collection, Wilson Library, University of North Carolina at Chapel Hill. This entry was posted in North Carolina Collection and tagged Fort Macon, Frank Leslie's Illustrated Newspaper, USS Merrimack. Bookmark the permalink.